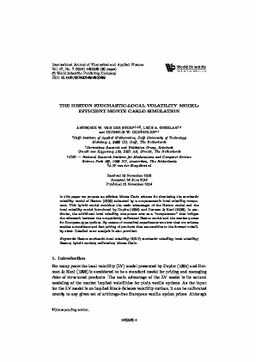 In this article we propose an efficient Monte Carlo scheme for simulating the stochastic volatility model of Heston (1993) enhanced by a non-parametric local volatility component. This hybrid model combines the main advantages of the Heston model and the local volatility model introduced by Dupire (1994) and Derman & Kani (1998). In particular, the additional local volatility component acts as a "compensator" that bridges the mismatch between the non-perfectly calibrated Heston model and the market quotes for European-type options. By means of numerical experiments we show that our scheme enables a consistent and fast pricing of products that are sensitive to the forward volatility skew. Detailed error analysis is also provided.